« Frank Gutch Jr: Notary Sojac: The Band and the Legend, Plus Notes…..
My favourite covers are the ones with a twist; I LOVE when a band or artist takes a song that falls into a polar opposite genre of the music they normally play. I love it even more when, somehow, that opposite genre song is molded, changed and adapted in such a way that it becomes the covering band’s song, in its own way. That ability to take a song that you didn’t write, and would normally not play, and turn it into something incredible and still personal. That’s the kind of cover that challenges fans’ perception, and musicians ability. A band that’s a total champion at making cover songs unique and interesting is Me First and the Gimme Gimmes. The nineties punk band has made a name for themselves by taking songs of all styles and genres, churning them through their high energy punk rock machine, and blasting them on stage to a crowd of rabid, ecstatic fans. The combination of their creative genre bending, their extremely entertaining stage presents and the rabid excitement that is that moment the audience figures out exactly which song they’re playing makes for a fantastic concert experience. Check out their rendition of “Don’t Cry for me Argentina” from the Evita Soundtrack. Trippy, huh? It’s amazing what can happen with you blur the lines of musical classification, especially with a familiar tune. For the rest of you cover lovers out there, I’ve picked out a few of my favourite, both new and old, cover songs. Speaking of genre bending, let me draw your attention to the vocal vixen that is Patrizia. Not since Queen have rock and opera been so fantastically paired and so fashionably presented. Patrizia applies her four octave range pipes to the most unexpected of rock and alternative songs, producing incredible results. Check out her version of “Creep” by Radiohead. Thom Yorke, eat your heart out. That’s a voice that needs to be heard to be believed. What I love most about this song, and the singer, is the wonderfully tenuous balance between control and rebellion. The dedication, training and discipline that it takes to cultivate a voice like that, and the free spirit that personifies a love of rock and roll must constantly be dueling constantly in Patrizia, and it’s that battle that fuels her to make such amazing music. If you want to see for yourself, come out to the Mod Club this Friday (Event info here https://www.facebook.com/events/504877216227409/). Just be prepared to be amazed. I may have written about this cover before, but whatever I may have said in teh past bears repeating for this beautiful rendition by such an iconic musician. I can’t hear Cash’s warbling, heart wrenching vocals on this track without tears forming in my eyes and goosebumps covering my skin. It’s a true example of an artist taking a song and truly making it his own. Trent Reznor himself has all but surrendered the track to the estate of Johnny Cash. While Reznor is a brilliant musician in his own right, Cash’s version of “Hurt” makes the original seem hollow and childish. The fact that both Cash and his beloved wife June Carter succumbed to illness (Carter) and a broken heart (Cash) within months of each other and the song’s release make the song all the more poignant. I dare even the coldest hearted person not to feel SOMETHING upon hearing this song and watching the haunting video. The potty mouthed Canadian singer/wrapper has long been a favourite of mine. Ex roommate to songbird Feist and purveyor of punky prose, Peaches (nee Merrill Nisker) can always be relied upon to put out a killer tune. Generally her musical wares veer towards hypersexualized aggressiveness (much like many of her male counterparts in the rap world) which can only be classifed as awesome, but one of my favourite tunes Peaches has ever put out is this cover of Iggy and the Stooges “Search and Destroy”. Her feminine voice, punctuated by that screeching howl that Iggy himself must envy, really grabs me in this track. The almost techno vibe and electronic beat fuse into the listener’s body, making stillness impossible. Found on the Warchild Heroes record, this is a great cover performed by a great Canadian artist. Tom Wilson gave me a copy of The Folk Sinner on the night of the inaugural Bobcast back in March and i’ve had a hard time keeping that cd out of my player ever since. My addiction to this album is all because of this song. I had never heard the original (first recorded in the mix sixties by Gordan Lightfoot) until i started writing this piece, and I have to say that LIghtfoot’s version leaves me cold compared to Wilson’s. Though the arrangements are very similar in their simplicity, Wilson’s deeper, raspier voice conveys the heartbreaking tone of the song far more to me than Lightfoot’s did. And, as a huge fan (and incredibly poor student) of bass, I can’t help but be drawn in by the bass and percussion only accompaniment to Wilson’s bluesy drawl. It’s a song that makes my long carrides home all the more tolerable, and helps keep me awake as i try (and spectacularly fail) to do vocal justice to it myself, much to the chagrin and disapproval of my fellow commuters on the Eastbound QEW. “You Rascal You” is probably one of the most foundational songs of American blues music, and has been covered many times over by the likes of Louis Armstrong, John Fogerty and Dr. John before El Khatib tried his hand at it, to great success in my opinion. The fuzzed out guitars, the tired, absolutely exasperated sounding vocals, somewhat muffled in that signature rough garage away all convey the feeling that songwriter Sam Theard was trying to convey so many decades ago. I can’t write a column about covers without giving a shout out to the adorable boys in Xprime. While most of their live shows generally consist of covers (with a smattering of great original material), their standout take on a song they didn’t write has to be “I Believe in a thing called love” by the Darkness. Xprime excel at paying homage to a song with their technically and vocally near-perfect performances, so it’s no surprise that they can totally rock this song while barely breaking a sweat. But something about how four young dudes, one in a bowtie, can rock out so well to a song originally brought to this earth by a group of long haired british miscreants just brings a smile to my face that you can’t wipe off. I won’t even include a video for this one – just come on down to a recording of The Bobcast one monday night and, if you ask nicely, Xprime will be sure to melt your face off with this incredible cover. Unable to make it down you say? Guess what? 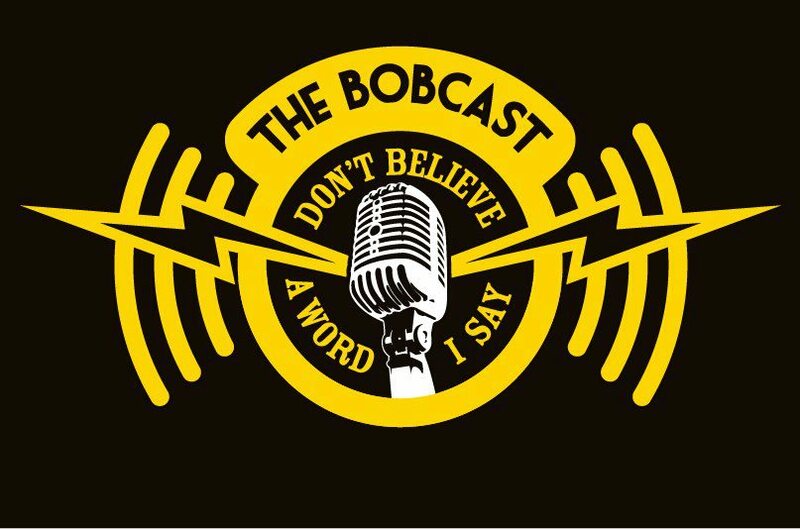 You can listen to the Bobcast right here! Listen to them all and get a feel for how great this band, and the entire Bobcast truly is. Nadia Elkharadly is a Toronto based writer with a serious addiction to music. Corporate drone by day, renegade rocker by night, writing is her creative outlet. Nadia writes for the Examiner (.com) on live music in Toronto and Indie Music in Canada. She has never been in a band but plays an awesome air guitar and also the tambourine. Check in every Tuesday for musings about music, love, life and whatever else that comes to mind. This entry was posted on May 29, 2013 at 4:40 am and is filed under Opinion with tags Covers, DBAWIS, Don't Believe a Word I Say, Dr John, Gordon Lightfoot, Hanni El Khatib, Johnny Cash, Lee Harvey Osmond, me first and the gimme gimmes, music, Nadia Elkharadly, patrizia, radio, Records, The Bobcast, the Darkness, Tom Wilson, Trent Reznor, Xprime. You can follow any responses to this entry through the RSS 2.0 feed. You can leave a response, or trackback from your own site.